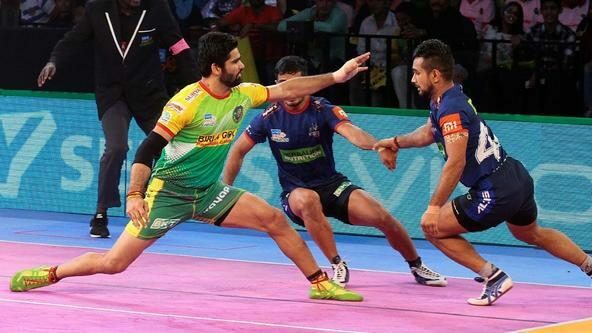 In-form home side Patna Pirates failed to derail Bengal Warriors as the latter made a fabulous comeback in the last minute to tie the match 37-37 at the Harivansh Tana Bhagat Indoor Stadium in Ranchi on Sunday. 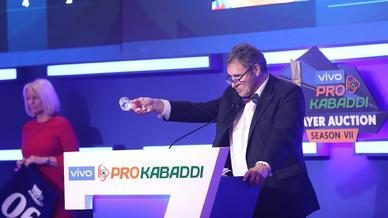 The match saw four Super 10s being scored with Patna’s Pardeep Narwal (13) and Monu Goyat (11) and Bengal’s Maninder Singh (15) and Deepak Narwal (10) taking the honours. Maninder started the match on a high by picking up four points in his first four raids to set the tone. Goyat, on the other hand, continued his exemplary form and soon completed the 100 raid-points milestone this season. The score kept ticking along with Patna leading 8-6 in the first quarter. 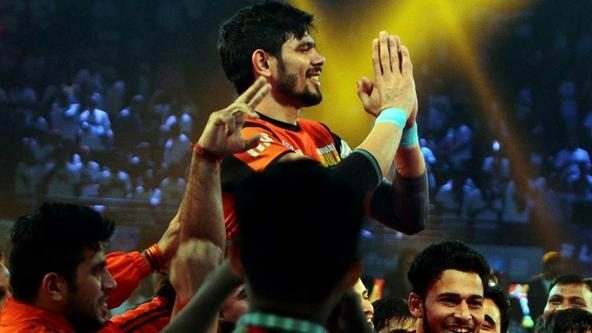 Patna managed to reduce the Warriors to three men on the mat, which led to the introduction of Deepak onto the mat. 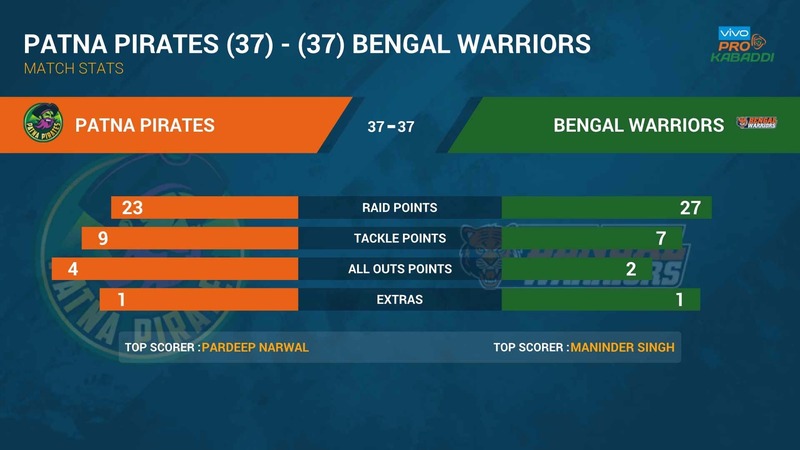 Even though the Warriors pulled off a super tackle on Pardeep, they succumbed to their first All-Out of the match in the 17th minute, with Patna extending their lead to 5 points. A couple of two-point raids from either side ensued in the dying moments of the first half but Patna entered the breather leading 18-14. 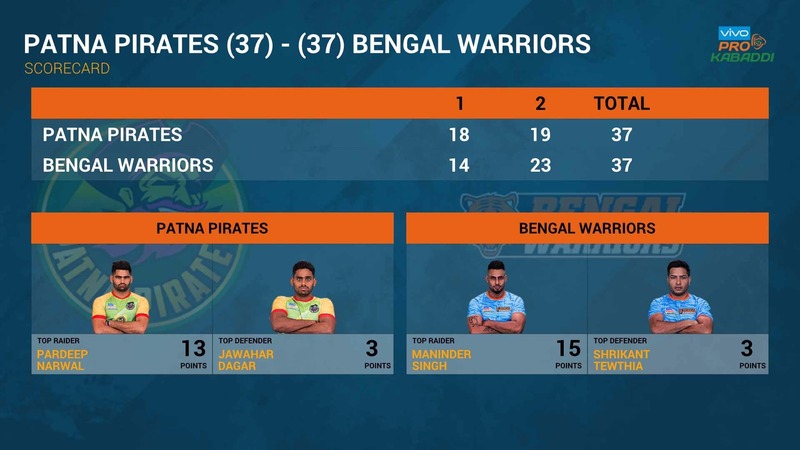 Patna’s dominance continued into the next half as Pardeep’s quick raids took the Warriors to the brink of another All-Out. 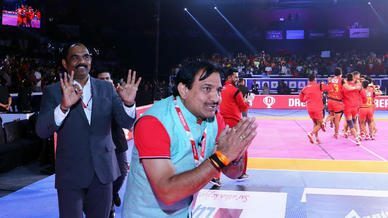 Maninder was the lone raider left on the mat but he was not to be thwarted. He pulled off a super raid to give the Warriors a fighting chance. However, the visitors succumbed to their second All-Out of the night in the 30th minute to trail 23-31. The Warriors, known for their comebacks, did not at all disappoint in the last quarter. 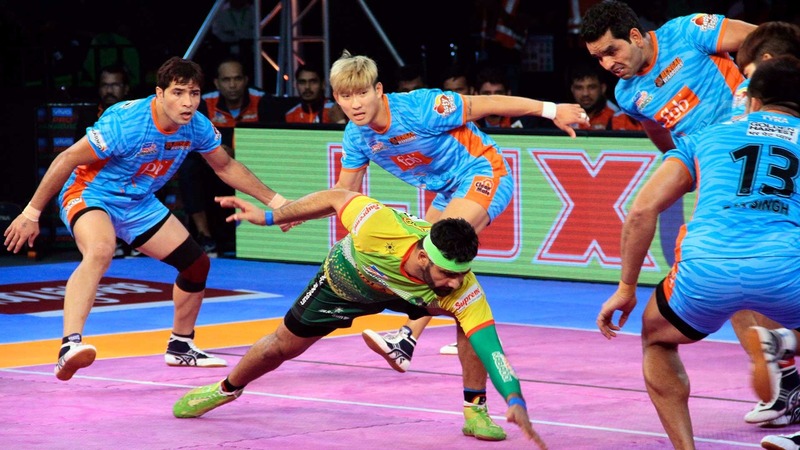 Patna put their foot on the brakes to waste time but Maninder and Deepak had other plans. With 7 seconds remaining on the clock and 3 points separating the teams, the Warriors handed the Pirates their first All-Out of the night to tie the match at 37-37.